Last night Effingham Parish Council held a Public Meeting about Berkeley Homes plans to build a new school and 295 new homes. 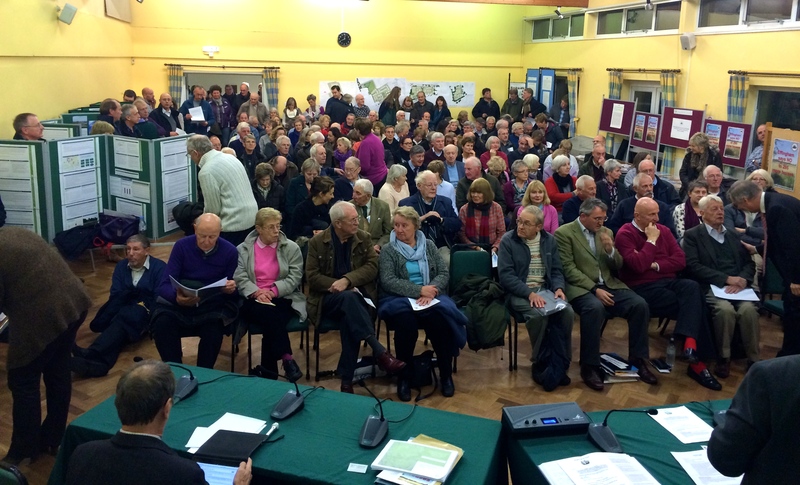 Over 200 residents of Effingham and Bookham packed into the KGV Hall. They were greeted by displays from the Parish and Effingham Residents Association. Then following an introduction by EPC Chairman Arnold Pindar the audience were given a tour de force presentation by Cllr Paula Moss who had lead the working group looking into the application. The focus of the presentation was the “very special circumstances” needed to justify building on the Green Belt balanced against the needs of the school to rebuild. At the end of the presentation, which had covered such matters as infrastructure, educational needs, flooding, environment, historic setting, wildlife and transport – backed by FOI statistics, there were questions from the audience. Following a short break the Parish went into a formal Meeting and voted overwhelmingly to object to the application – none of the councillors voted in favour however there was one routine abstention from the Borough Councillor Liz Hogger who is on the GBC Planning Committee and therefore must remain impartial.